Above, new Earthrise photo showing Earth straddling the limb of the Moon, as seen from above Compton crater on the lunar farside, taken by the Lunar Reconnaissance Orbiter spacecraft. The large tan area in the upper right of Earth is the Sahara desert, and just beyond is Saudia Arabia. The Atlantic and Pacific coasts of South America are visible to the left. On 24 December 1968, astronaut William Anders of the National Aeronautics and Space Administration’s (NASA) Apollo 8 mission, the first manned voyage to orbit Earth’s Moon, took his now famous picture of Earth rising above the lunar landscape. Image AS8-14-2383, which NASA later name “Earthrise”, would become the most influential environmental photograph ever taken. Earthrise not only vividly displayed to the American people and people all around the world how stunningly beautiful our planet is, but it also showed its vulnerablity – as the one and only place that billions of people and an equally large number of other animals and life forms have as their home, from Earth’s ancient past to time immortal. The Lunar Reconnaissance Orbiter spacecraft’s photo new earthrise photo also shows Earth’s beauty, as well its vulnerability. We here today are challenged with keeping this only known planet hospitible and livable for future human populations and other animals and life forms who have no choice but to live on this planet as there is no other place available. 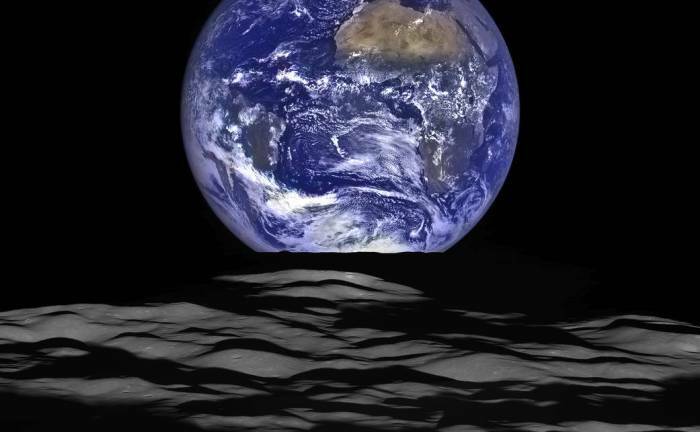 The lunar rocky foreground (the moon’s dark side) seems to encroach on Earth — our only home. Could this be a psychic metaphor for all the fossil fuel and chemical sludge beginning to strangle us in a death grip?